I've used Cutie 11 from the Cutie Collection. I colored the image with Copic markers. All supplies are from my long-hoarded stash. I used a Spellbinders' Classic Scalloped Circle SM die to mount the image on top. The sentiment is from Create with TLC. I am a follower of these blogs and display badges here. Thank you so much for stopping by! I hope you'll pop on over the Fitztown Challenge Blog and see what the rest of the team has come up with for this challenge. This is so sweet - bound to get a smile from whoever receives it! Glad you joined us for the Challenge at One Stitch At A Time, hope to see you come back soon! Adorable card! 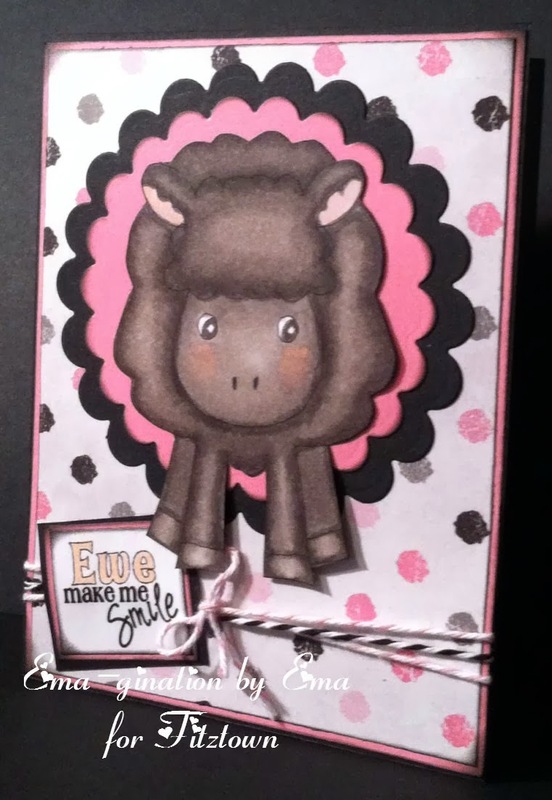 Perfect for our Add a Sentiment challenge over at Glitter n Sparkle Challenge Blog. So glad you joined us this week. Best of luck in the draw! We will have a new challenge starting tomorrow so I hope you can play along again! What a cute card. Love the image! Thank you for participating in last week's One Stitch at a Time Challenge! I hope you'll join us again soon!